In some ways, 15 makes for a frustrating experience. Just as I’ve settled into Nazik al-Malaika’s voice, and begin raising up the structures of her world around me, I turn the page and am with Abdul Wahab al-Bayati. It’s the pitfalls of any anthology, certainly, although here there is only one poem per author, and some of them very short. The brief collection begins with Badr Shakir al-Sayyab‘s “Rain Song,” and here we can brook no complaints: Although it is only one poem, and the reader may be left wanting a whole collection of al-Sayyab, it is a poem in which a reader can sit down, close the shutters, and sit for a long time. “Rain Song” is the longest in the collection, and this translation — from Lena Jayyusi and Christopher Middleton — does justice to the poem’s tonal shifts and incantatory power. could one day block our country from its path. If only we feared madness. or the sadness of impossible love. If only we could die like other people. Here as elsewhere, she inserts herself, interrogates the poem, asks questions of the translator. The notes after each of the poems are what holds the collection together; they offer not just biographical information on each of the poets, but personal insights into their lives and why they write. She also describes encounters she’s had with the poets, such as when Yousif al-Sa’igh offered her a sketch inspired by one of her poems. Poems by Saadi Youssef (“Cavafy’s Residence,” trans. Ferial Ghazoul) and Fadhil al-Azzawi (“Spare Time,” trans. Khaled Mattawa) follow. Both of them have a number of works available in English, with Youssef’s recent poetry collected into Nostalgia, My Enemy and translated by Sinan Antoon and Peter Money. The collection also features work not written in Arabic — a short and somewhat flimsy work by Kurdish poet Sherko Bekas and Ronny Someck’s “Jasmine: Poem on Sandpaper,” translated from the Hebrew by Moshe Dor and Barbara Goldberg. Here again — although I found Someck’s statement that he was “only the pianist” in the Wild West saloon of Israel frustrating — it was also eye-opening to see how he viewed his role as an (Iraqi-)Israeli poet. The last four poets are the youngest: Taleb Abd al-Aziz (the passionate and mournful “My Brother’s War”), Ra’ad Abdul Qadir (the slender “His Life”), Abdulzahra Zeki (the dual, overlapping “The Guard”), and Siham Jabar (the historically inspired “Like Hypatia in Ancient Times.”). The easiest questions to ask are: Why didn’t you include (Abdul Kader El Janabi, Sinan Antoon, Sabreen Kadhim, Ahmad Matar, Ghareeb Iskander, Basim al-Ansar, Kajal Ahmad, etc.)? There are many other Iraqi poets, for instance, in the 312-page collection Baghdad: The City in Verse, ed. Reuven Snir, which also came out last year. But Mikhail’s slim chapbook has an intimacy and immediacy that Snir’s thicker and more scholarly feeling collection — which roams over thirteen centuries — lacks. Certainly, you can find several of these poems online, but the chapbook is worth having both for the poems themselves and for Mikhail’s questions and reflections. Marcia, thank you for this wonderful review of the pamphlet. 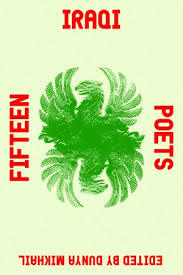 I respect the poets you suggested to include and many other poets who I wish could include if I had the freedom of an anthology and not a slim selection of 15 drops of water in the sea of Iraqi poetry. Again my sincere thanks and admiration for your work. How can we obtain the book? I’m sure you can also order it from your local independent bookseller. Enjoy! I’m practicing my life . . . Thank you so much for sharing. I think I need “Deceived Minutes” as a personal anthem….